... ... A tetraflexagon is a 2x2 square, which you can fold from a strip of paper. The point is: If you open the flexagon like a book on the reverse side, then a new face appears, which was hidden before. In the simplest case the tetraflexagon has three faces. It is called the tri-tetraflexagon, 3-4-flexagon. Furthermore there are the tetra-, penta-, hexa-tetraflexagon and so on with 4, 5, 6, ....faces. ... ... Draw the figure of seven squares on checked paper and cut it out. Choose a=2cm e.g. as length of the square. On this page the front side is green, the reverse side is blue. ... ... Write the numbers 1, 2, and 3 on the squares. Two squares get the letter x. They will be glued on each other later. Fold the strip on the red line, so that the squares with 3 lie on each other. ... ... Push the square with 3 under the green square 2, so that two 3s lie on each other. ... ... Glue the x-squares on each other on the reverse side. ... ... The tri-tetraflexagon is finished. The front face has the number 2, the reverse face 1. The number 3 is hidden. How to find the third face 1 Turn the flexagon that face 2 is on top. 2 Fold the flexagon downwards. There is a mountain behind B. 3 Lay the edges behind A and A on each other. 4 Open the flexagon like a book. 5 Spread out the flexagon on the plane. Face 3 is on top. The two faces 12 stand at the beginning. The face 2 can be opened, because 2 also stands on the right side of the line. The other number on the right (3) is the face, which you can see after opening. It is possible to go backwards. You can open 2 and then face 1 appears. The flexagon has four squares, but it is formed by six square sheets of paper. The sheet with x doesn't count. Two sheets lie on each other or two sheets are single. The single sheets lie in direction of the diagonal \ , two layers in direction of the main diagonal /. It doesn't depend on the numbers. ... ... Faces 1 and 3 have two loops. A pencil shows them. These are the faces, which you can't open and which become "dead ends". ... .. The face 2 has two points, which lie in direction of \ . These are squares, which are free on two sides. This is the face you can open. Later on you will see that the "higher" flexagons have a similar structure. ... ... The flexagon is the same, if you rotate by 180° around the centre of the flexagon. If you reflect the tri-tetraflexagon on the vertical centre line, you get a new flexagon. You can easily make it. ... ... If you reflect the template from above, you get a template for this flexagon. The mirror image has the same structure and gives no new aspects. Therefore you don't distinguish between both forms. Draw the rectangles 4x2 and 2x1 and cut them out. Cut along the yellow lines in the bigger rectangle. Glue the square B on b. Then the square A lies over square a. Write the numbers on the squares and x as shown on the left. ... ... Fold the strip so that the squares with the 4s lie on each other. The figure of the tri-tetraflexagon has developed. Lay 3 on 3 again and glue x on x. ... ... Open the flexagon in the same way as the tri-tetraflexagon. This is shown in the diagram on the left. Make the template as shown on the left. Lay the squares 4 on 4 twice. Lay 3 on 3 twice, too. Push the square x under the square. Then x lies on x and another 1 on top. Glue the x-squares on each other. ... ... The special feature of this flexagon is that you only get square 4, if you open the square 2 horizontally, starting at 32. This is described by writing 42 under 32 in the diagram. Prepare the template as shown on the left. Then x lies on x and another 2 on the top. ... ... It is special that this flexagon can be opened along a circle. Lay the squares 6 on 6 twice. Lay 5 on 5 twice, too. ... Lay 4 on 4 twice and 3 auf 3 once. ... ... Push square 3 under the green square so that two 3s lie on each other on the reverse side. Fold 1 backwards and glue x on x. The flexagon is finished. ... ... If you open the flexagon systematically you get the diagram on the left. It has the pattern of two squares with one corner in common. You go along two circles with the join 12. ... ... The faces 1 and 2 appear three times and form a cross. The faces 3, 4, 5, and 6 appear twice and make the free sides of the double square. ... ... The flexagon consists of 12 sheets, which spread over four squares. These squares can have 1, 2, 3 or 4 layers. Two squares side by side have 1-5, 2-4 or 3-3 layers. If you count all layers for every position of the flexagon, you get the diagram on the left. You also can make the cyclic tetra-tetraflexagon without gluing. You find descriptions on Arvind Gupta's web site (URL below). 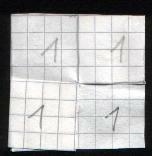 Make the following papers by laying squares on each other with the same numbers. Start with the largest number and go downwards. You find more tetraflexagons, if you glue two pairs of squares with the same numbers on each other. Make a template shown on the left. Cut out also the squares inside. Fold on the red line. There is a valley. Fold on the red line. Put the green square 6 on the left under the 3 next to it. ... ... You find the faces 1 to 5 by the usual process of opening. The paths between 53 and 65 and between 34 and 46 require a new technique. David Mitchell calls it "tube flex" (3). 1 Look at face 4. Face 3 is on the reverse side. 2 Fold on the blue line. There is a mountain. 3 Open the flexagon to a tube. 4 Lay the lower and the upper corners on each other. 5 Spread out the paper. 6 Turn over the flexagon vertically. 7 Open the flexagon. Face 6 is on the top. You find templates of these kinds of flexagons in David Mitchell's book (3) or on Harold V. McIntosh's web site (URL below). There are more pages about flexagons on my homepage: Flexagon, Flexatube, and Hexahexaflexagon (German only). Kaleidocycles can be seen as three-dimensional flexagons.